Here is QR code construction in St-Janvier de Mirabel by Air Fest which sets a new benchmark at a massive 15,625 square feet QR code. Air Fest is Quebec is aiming at at World Biggest QR code title with heir QR code so check out the video below. Scandinavian Airlines displayed two QR Codes as part of their “Couple Up to Buckle Up” 2 for 1 travel campaign. 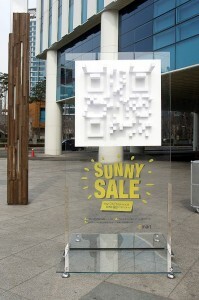 The copy accompanying the QR Codes instructed consumers to scan the left and right codes simultaneously with two different mobile phones and to then bring the two phones together. When the scan resolve video played, the separate left and right mobile phone screens essentially made one split screen, which then enabled the two participating consumers to view the video properly and discover the special 2 for 1 promotional code (see video above). If played individually, the left or right scan resolve video content would be close to meaningless. This video illustrates how QR Codes can be used to enhance learning opportunities for students at McGuffey School District in Claysville, PA.
Do you know how to use a QR code? Miami Herald technology reporter Bridget Carey helps you decipher the trend of two-dimensional barcodes. Take a behind the scenes look at how Instructables created the LED QR Code for RadioShack’s The Great Create.